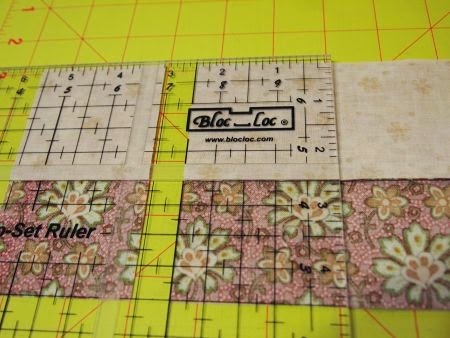 I would testify that the Bloc_Loc rulers are the single greatest invention for quilters since the rotary cutter! 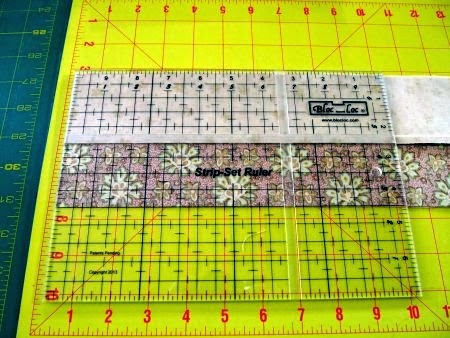 I bought two new Bloc_Loc rulers at the Springtime in the Rockies show this past weekend. 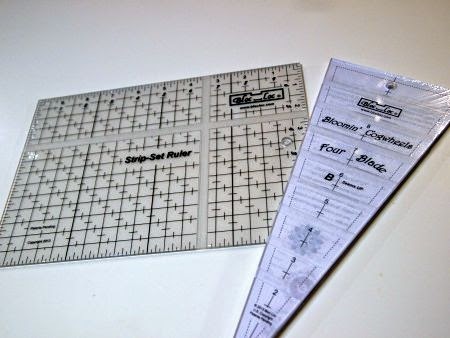 Here is a photo of both of them; today I'll only talk about the Strip Set Ruler. 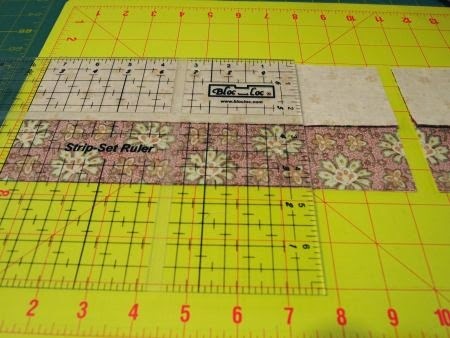 The Strip-Set Ruler is made to work with 2.5" strips, so it's perfect for jelly roll projects. It can also be used with wider or narrower strips -- but I'm making four-patches from 2.5" strips today. Press the seams in one direction. I've pressed them toward the darker fabric. 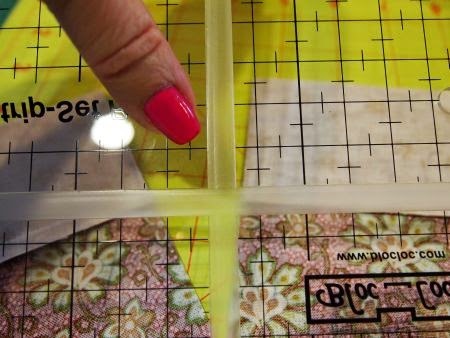 Place the ruler on the strip set and "snuggle" the groove onto the seam. 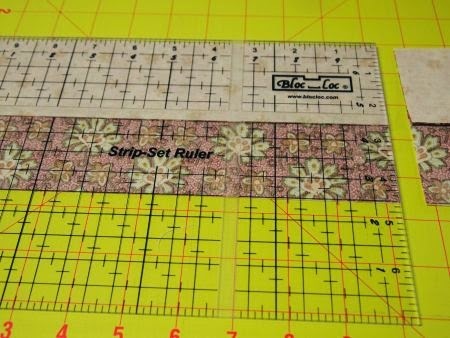 If your strip set is pressed so that it has a bit of a "curve," locking the ruler onto the seam will automatically straighten the seam and result in a perfectly perpendicular cut. Note: My photos show instructions for a right-handed cutter. If you cut left-handed, watch Janna's video on YouTube! Here, you can see there is a darker black line at 2.5" increments on the ruler. Slide the ruler to the left until the 7.5" line coincides with the left edge of the strip set. 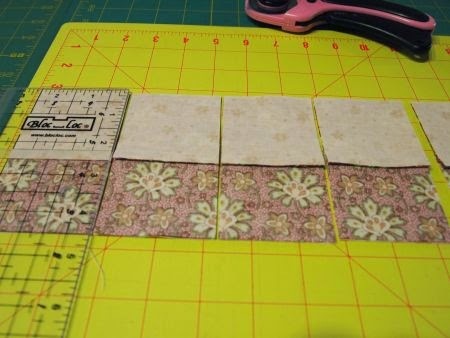 Since I'm making a pile of four-patches, I layered two strip sets, wrong sides together with the seams "snuggled," and used the ruler to cut both layers at once. Although the Strip Set Ruler instructions don't call for this method, it worked perfectly for me. Bloc_Loc now has its own YouTube channel with instructions for their tools. 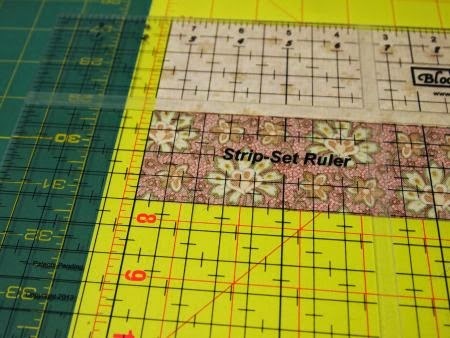 I urge you to go here and watch Janna's instructions for using the Strip Set Ruler. 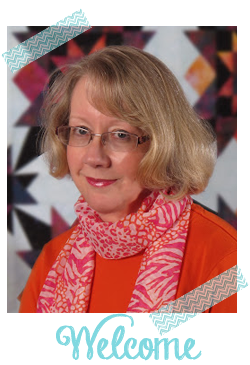 I bought my ruler from a new shop in Loveland, Quilter's Dream. They're just getting started as a shop, but I bet if you call them at 970-669-2441, they'll mail you a ruler! Or you can go to the Bloc_Loc website and order direct from the manufacturer. Come back next week to see what I make with the other ruler shown, the Bloomin' Cogwheels Ruler! Very good idea to have the groove to sit over the seam.